I know its summer and all but IT WAS HOT! 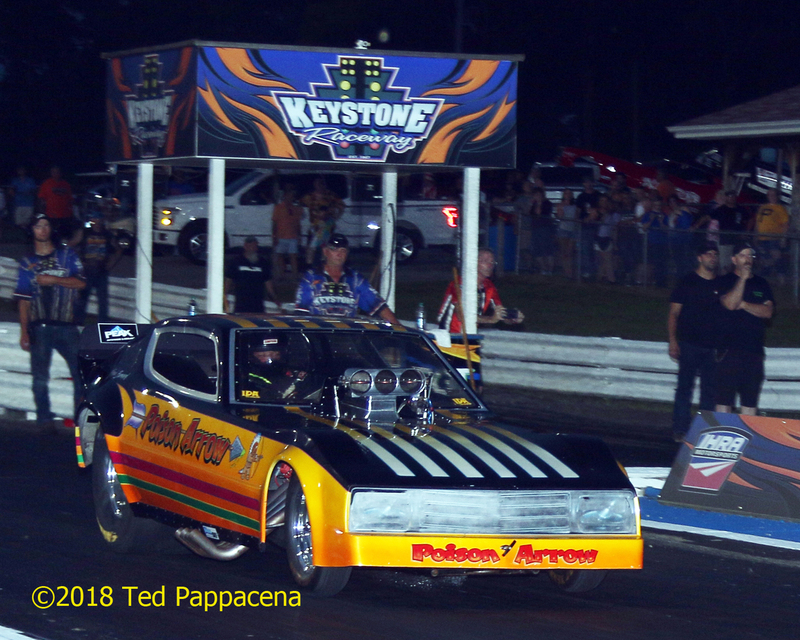 That said, this was my first F/C Nationals and my first time at Keystone Raceway Park in New Alexandria, Pa. What a great facility and the great people who are associated with it that made me feel right at home; Greg Miller, Jim Senkewicz and Bill Truby to name just a few. They are to be commended for a job well done. and yet he managed to elude both rounds’ burnout awards. First off I want to say “Thank You” to each and every team that showed up to put on such a spectacular show. Something like 56 runs (with very few incidents) in less than 3 hours. It was a hot and humid day and each and every one of the crew members worked very hard to do their absolute best and I for one greatly apprecite what I saw. Denny Salzwimmer stands at the ready running his most successful event yet. 11th if you’re keeping score. Denny Salzwimmer is to be commended for putting on such a grat event. He ran it with Swiss watch precision and was very accommodating to me with getting me situated with credentials. And the fireworks at the end of the event may actually still be going on (they were that good!). 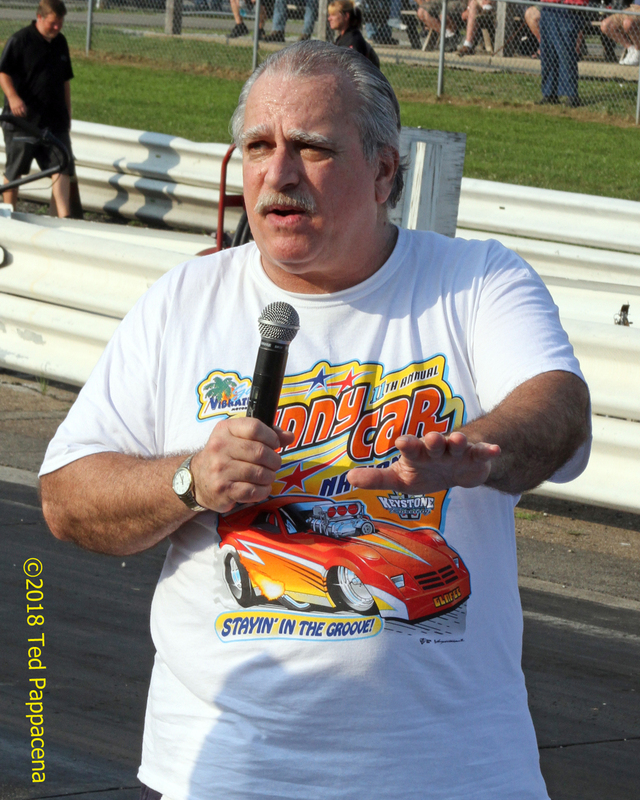 I also wish to give a shout out to both Bret (the Encyclopedia America of Drag Racing) Kepner and Bill “Drag List” Pratt for keeping us informed and entertained during the event. Now to the event itself. 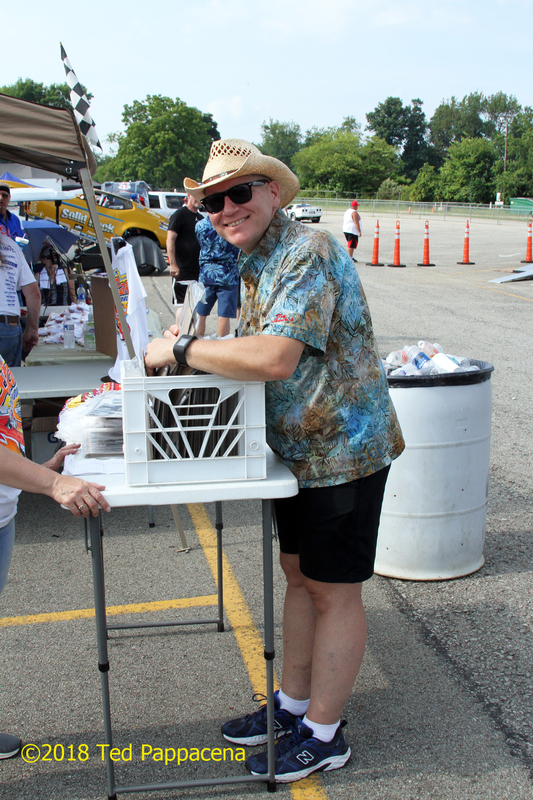 Entries were in no special order; Chris and Krista’s Total and Temporary Insanity Monzas. 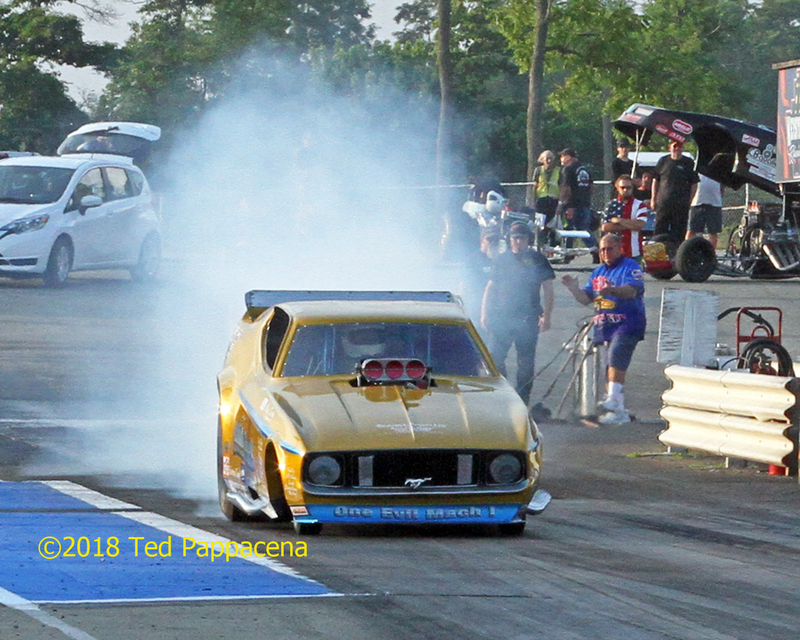 Joey Haas’ Nimrod Mustang, Bob Daly & Son’s War Horse Mustang II, Mike Kurtz’s 70 Duster, George Monohan’s injected Rain Maker from Canada, the Smokey Bonz Chevy II, the Pol-Cal Corvette, Steve Crook’s Feelin’ Groovy Vega, Kevin Johnson’s Quarter Pounder Firebird, Phil Landrum’s Easy Money Camaro, John Cerchio’s War Path Buick Regal, Willie Johnson’s No Money No Funny inject Nova, Frank Bernard’s Poison Arrow, Mike Johnstone’s Illinois Patrol, Rocky Ausec’s Solid Rock Mach 1 Mustang, John Palenta’s Crazy Bear Vega, the Horvath’s Junior Vibes Tempo, Mopar Missile Charger, Happy Hour Corvette from California, the Stambaugh’s Generation X Corvette, Bill Wells’ Nitroflier Omni, the Sweetman Brothers Citation, Jami Russel’s Iron Outlaw Mustang II, Ron Ooms’ Streakers Ride Camaro, and John Troxel’s Brutus Mustang. Whew! as well as the best reaction time awards. 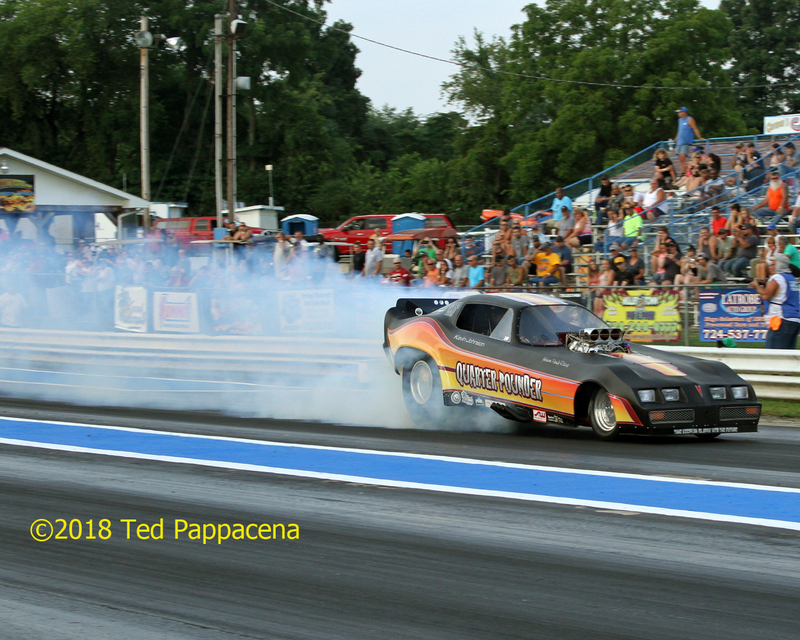 Kevin Johnson’s Quarter Pounder Firebird took the second round burnout contest honors. Mike Kurtz’s Chasing My Childhood II Duster gets a bit out of shape in his first round burnout. 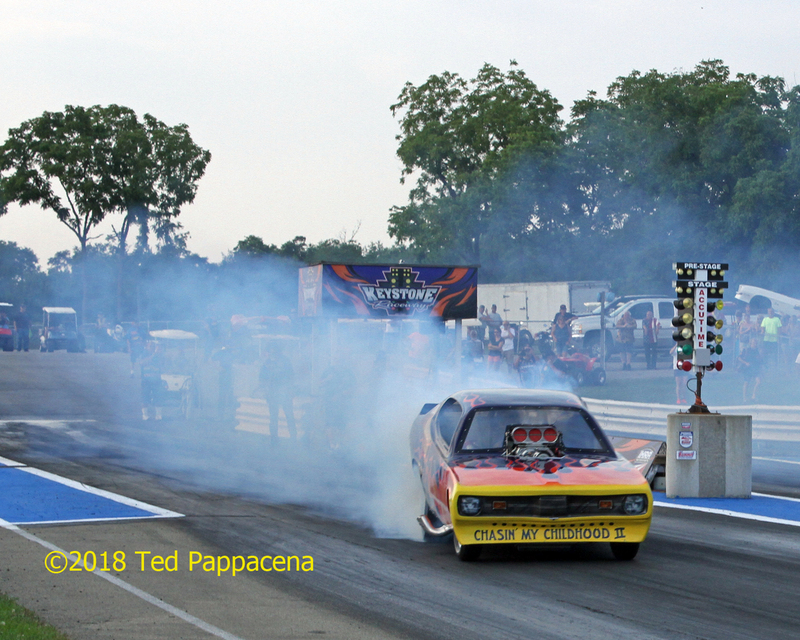 War Path Buick Regal puts down a strong first round burnout with John Cerchio at the controls. 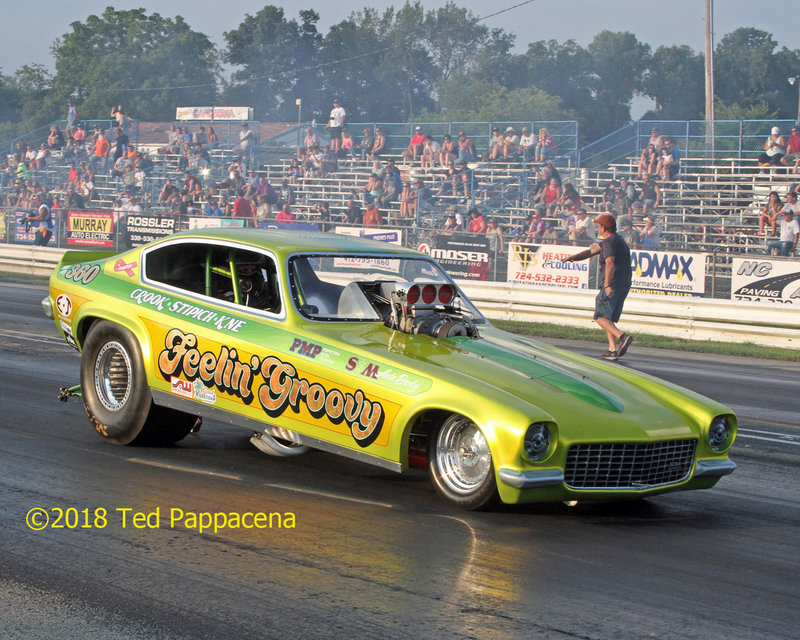 Steve Crook’s Feelin Groovy Vega is another stunner as it backs from a burnout. 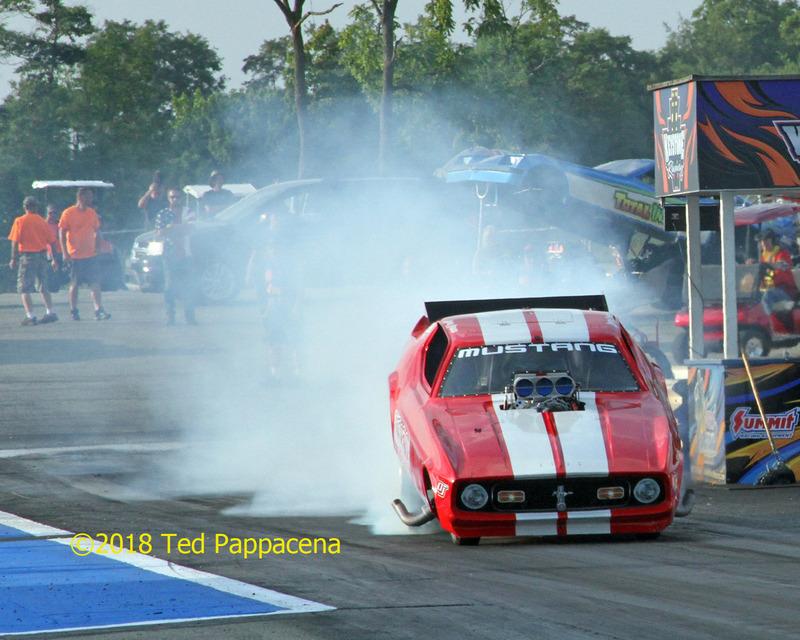 Rocky Ausec starts to smoke em in the Solid Rock Mustang Mach 1. 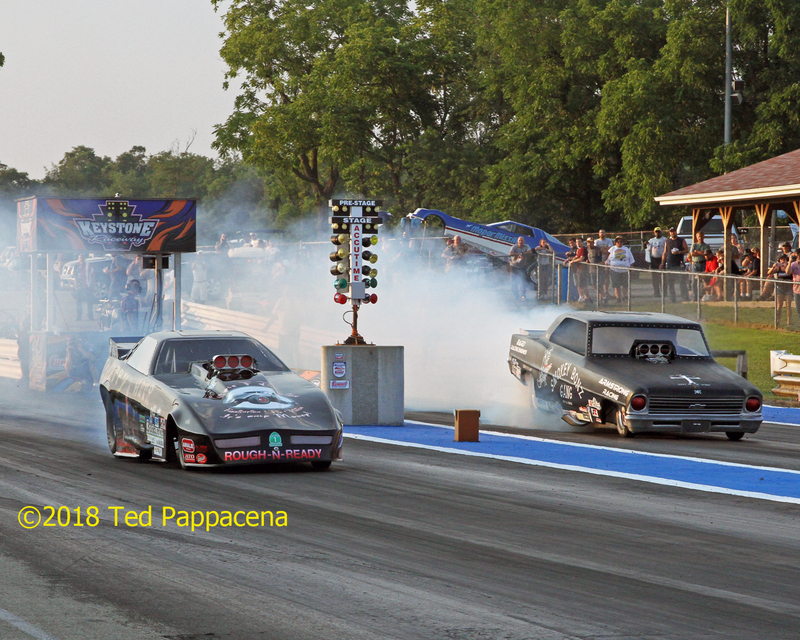 Happy Hour Corvette and the Smokey Bonz Gang Chevy II smoke em side by side. 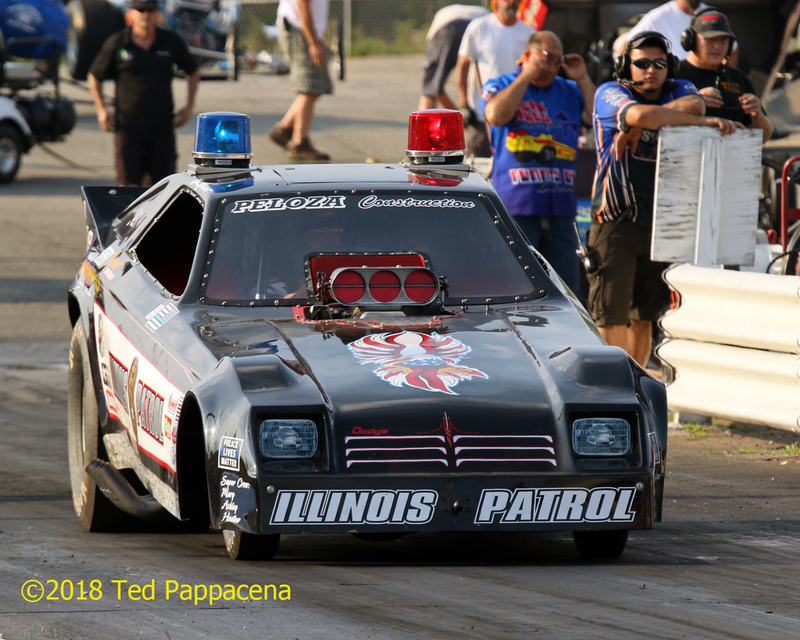 Mike Johnstone’s Illinois Patrol Omni literally “lit” things up on each of his 2 passes. Shades of “Black Magic”. 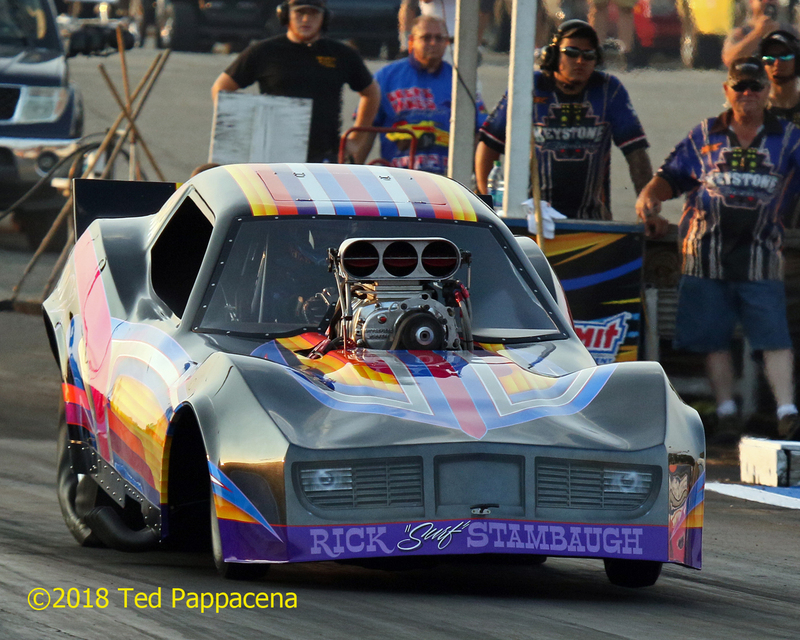 Robin and Matt Stambaugh’s Vette is killer! Jami Russell’s gorgeous Iron Outlaw Mustang II made 2 solid passes and lots of neat dry hops. Prepping 2 beauties- War Path and Feelin Groovy. 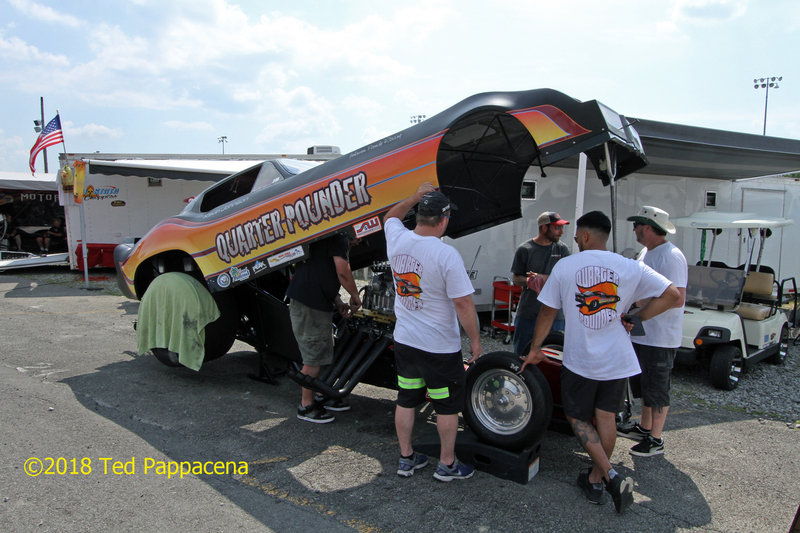 Group think as Kevin Johnson gets the Quarter Pounder Firebird ready. John Kwasnewski’s Pol-Cal Corvette backs from a burnout. Willie Johnson in his No Money No Funny Nova in the first round of injected funnies. All cars made 2 runs with the two quickest E Ts on a 7.0 index running each other in the final for both blown and injected. 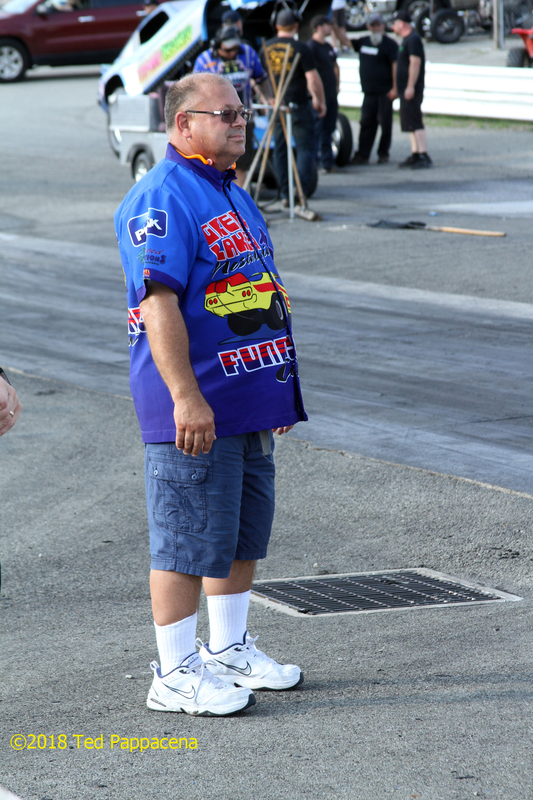 There was a burnout contest judged by Bill Pratt for both the blown and the injected entries. I’m pretty convinced that Chris Masserella is secretly testing slicks for M/T to see which pair can take the most abuse. In the first round he laid down a 700 footer that wowed the crowd and took the award for his first round fog bank. As did a much improved (to me) Kevin Johnson in the Quarter Pounder Firebird who took round two’s award and an unofficial Honorable Mention to John Palenta’s Crazy Bear Vega that killed a lot of mosquitos as well. That Vega had the cockpit smoked in well before the 100 foot mark. Unreal! 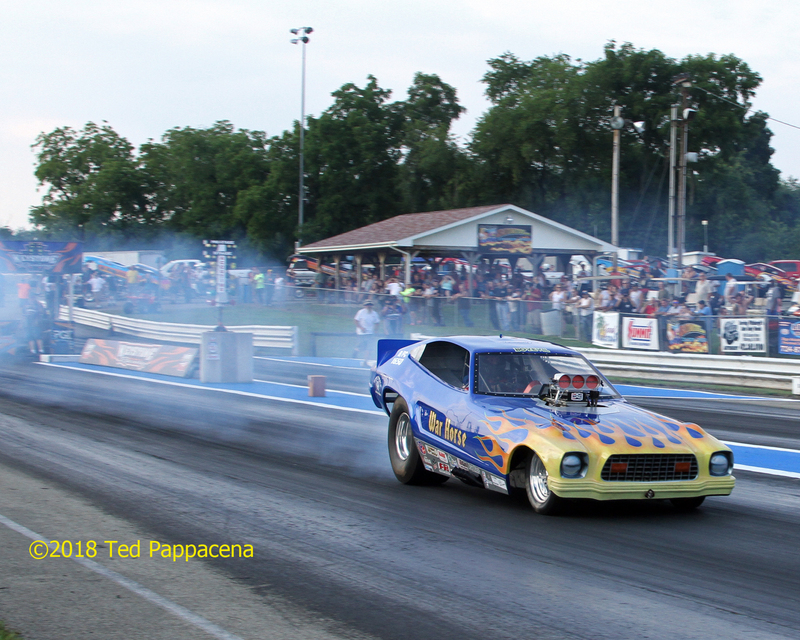 Bob Daly ‘s Mustang II took the award in the injected class as well as the best reaction time and top speed at 168 mph. 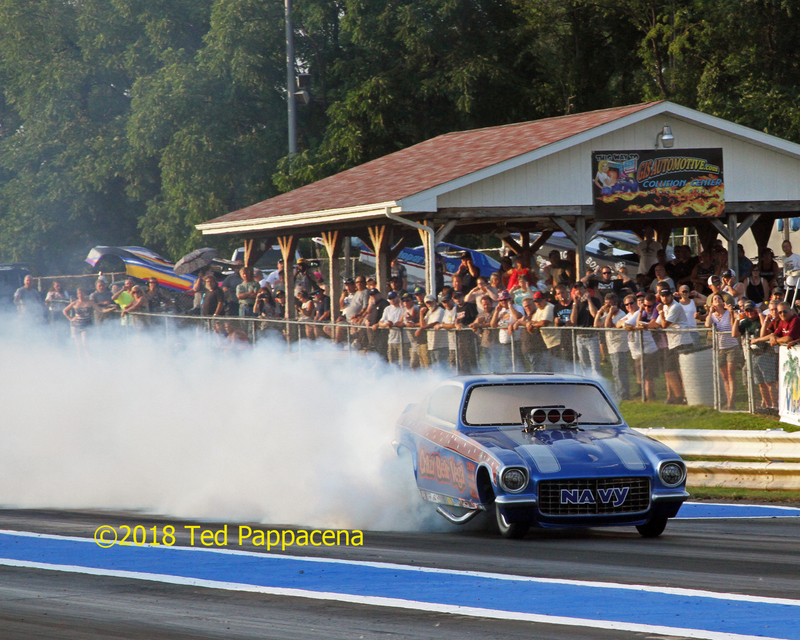 Best reaction time for the blown cars went to Joey Hass for an incredible 0.002! I’d be remiss if I failed to mention that there were dry hops too. Lots of em’! 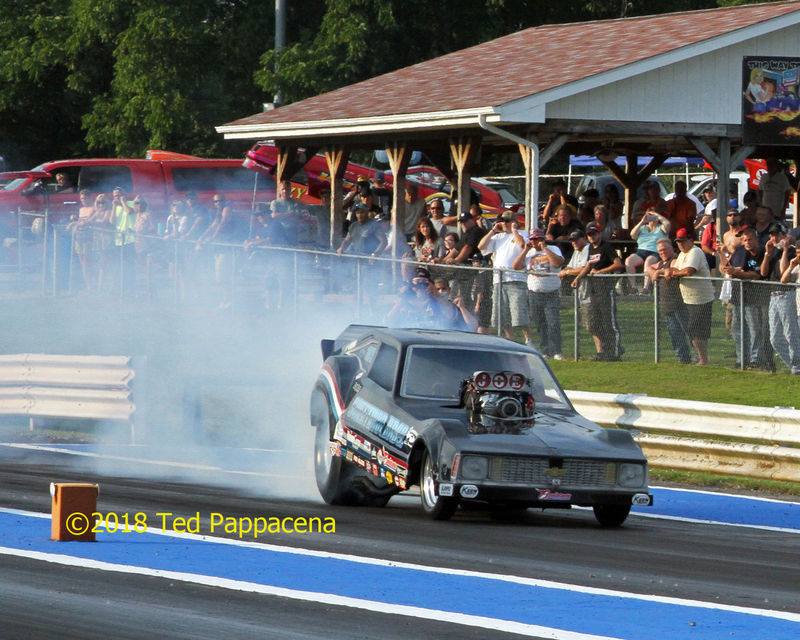 Joey Haas puts forth a strong burnout. 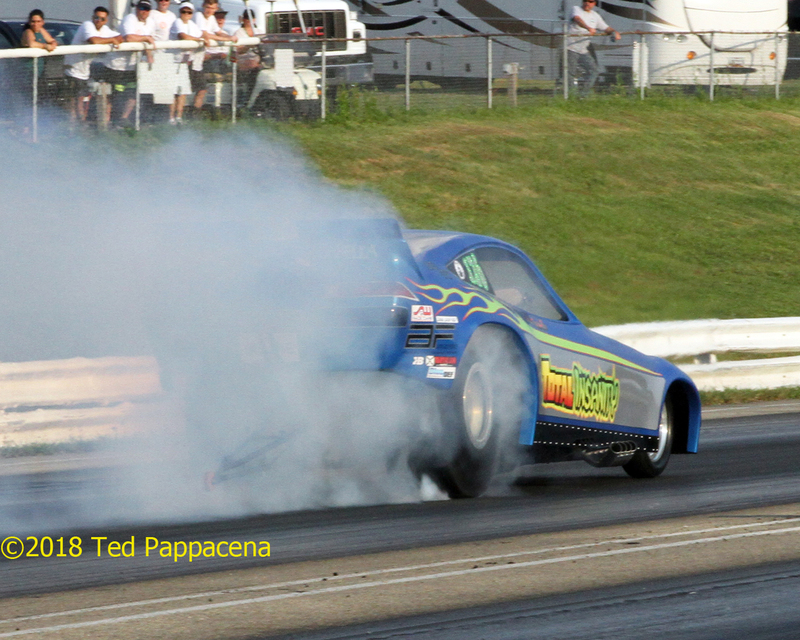 The Nimrod Mustang sports a steep forward rake and Joey took the Reaction Time Award with an unreal .002! 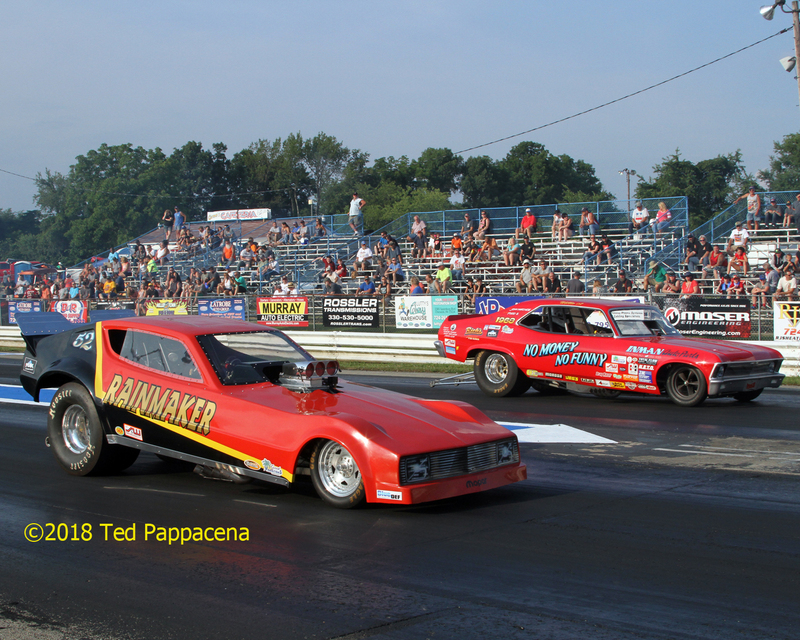 It all boiled down to Chris Masserrella’s holeshot win 7.03 to Bill Walls’ valiant but breakout 6.87 in the final. 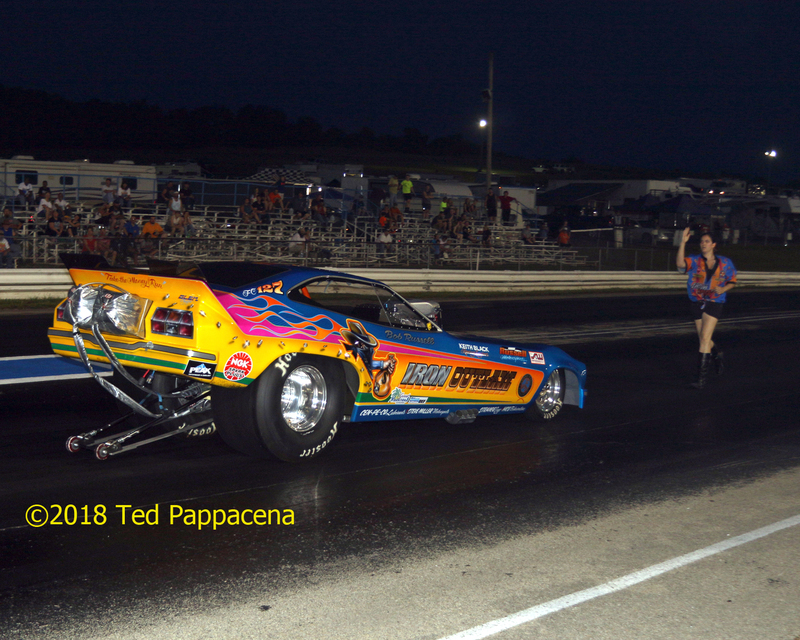 It was Chris’ second straight victory On the injected side of the day Willie Johnson took on arch rival Frank Bernard in the Poison Arrow with Frank taking the win. and eventually the race for his second win in a row. 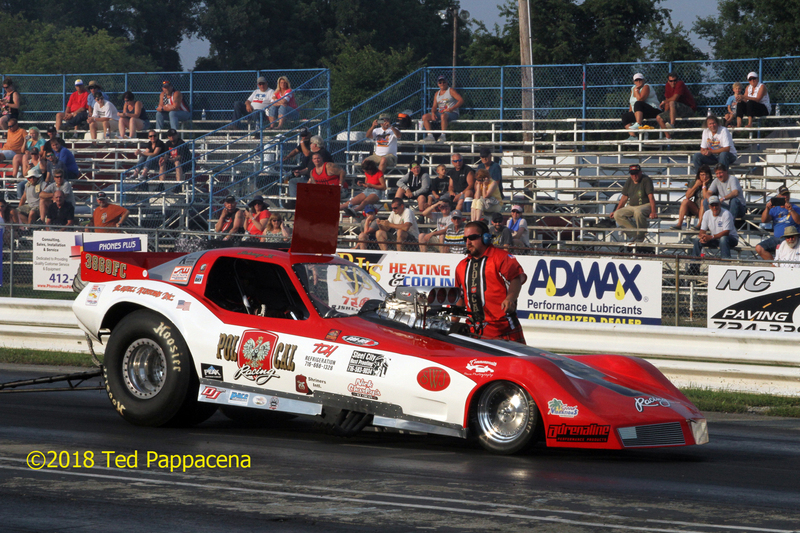 Your injected funny car winner; Frank Bernard in the Poison Arrow. There’s just one more thing. 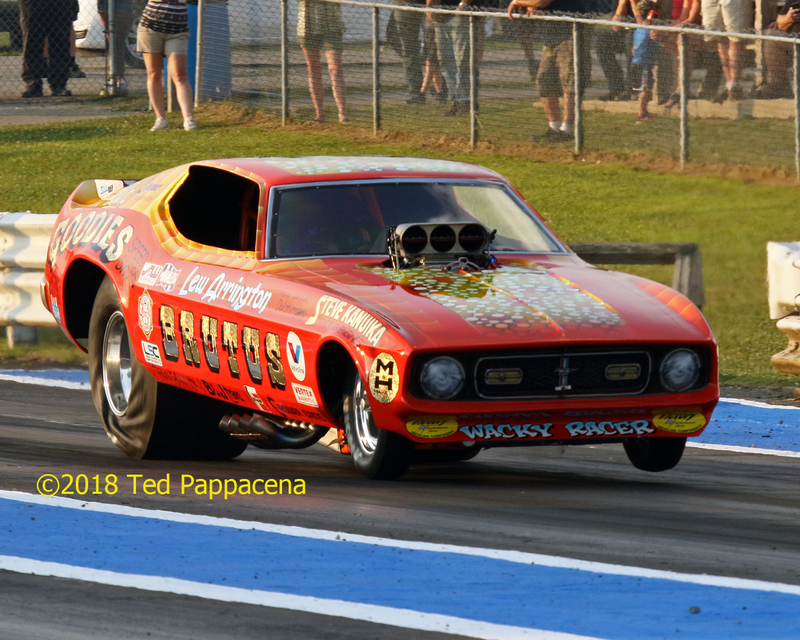 Those of us who major in the history of drag racing remember an iconic photo by Steve Reyes of a certain GTO funny car that exploded a clutch at Lions Drag Strip in 1967. That car was Brutus and thus began Lew Arrington’s legendary string of Brutus Pontiac and Mustang funny cars. In 1970 Lew went to the Mustang body with the hemi power plant. 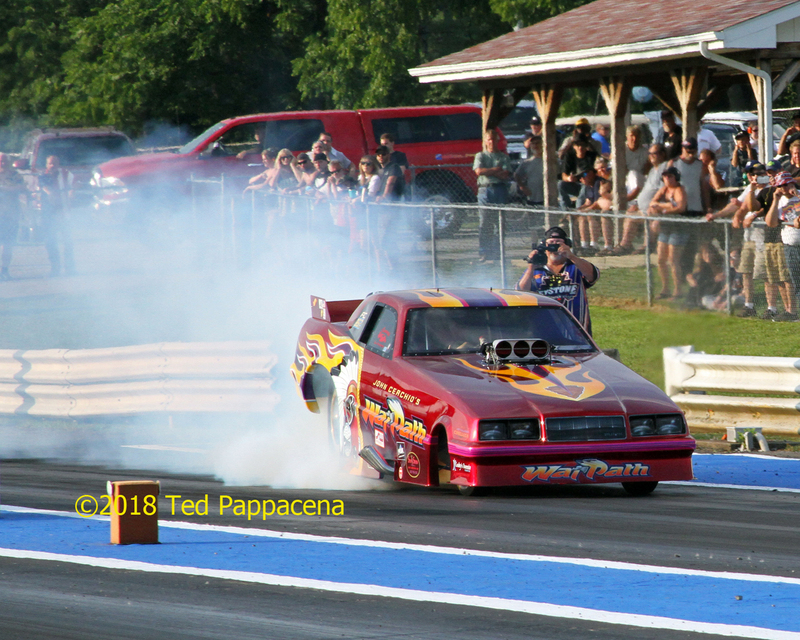 Although it said “Wacky Racer” on the front spoiler, it really wasn’t because most every funny car was switching over to the venerable motor. In any case it was the amazing paint jobs that adorned the cars over the ensuing years that grabbed our attention. It sported candy orange paint with shades of everything and the iconic nitro molecule pattern running through the top. 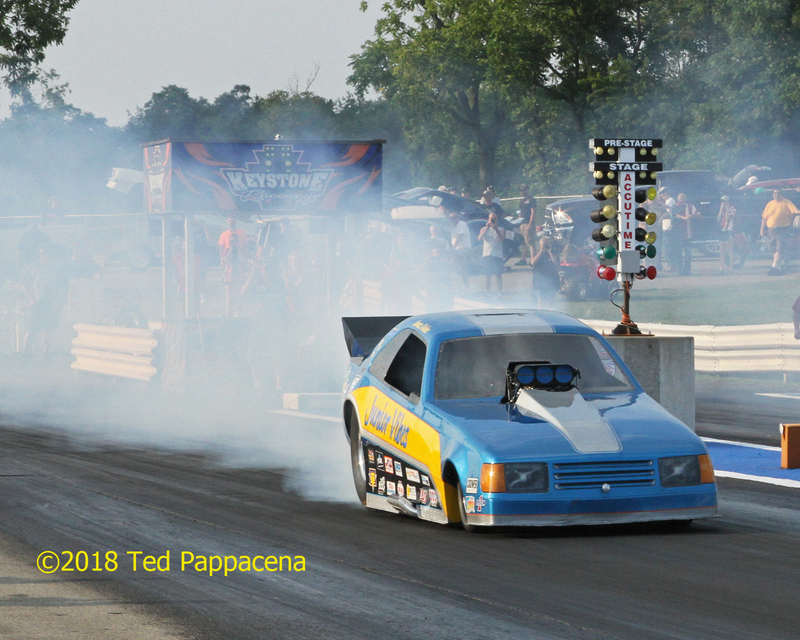 Ten years ago that car was re-created by New Jersey resident and drag racing photographer/TAD driver Dave De Angelis with the intent of running it (on alky) at some point. 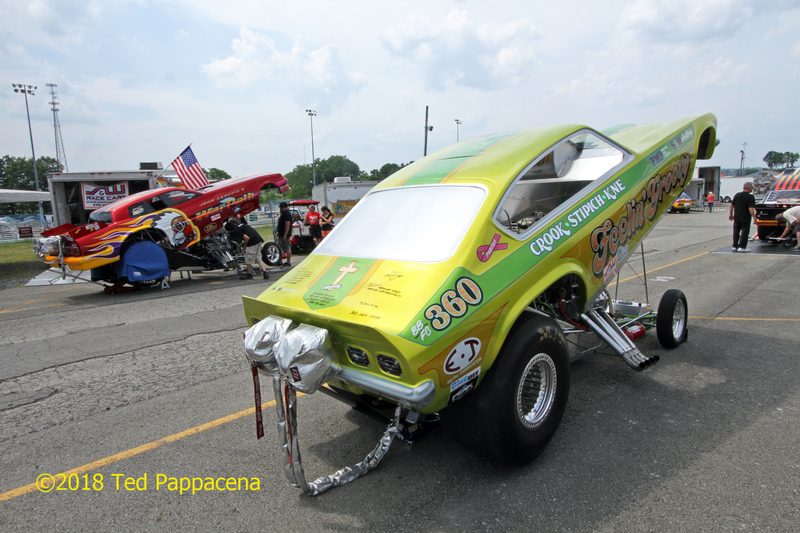 During the next 10 years I’ve seen and photographed the car on display at ATCO and Englishtown. It is truly stunning and joins War Path and Feelin Groovy in the” impossible to take a bad photo of it” category. However it never set foot on the track as a runner and eventually Dave put it up for sale. It was recently (within the past 2 weeks as of this writing July 16, 2018) sold to John Troxel of Missouri and he promptly tested it and it was rumored via the internet to be in attendance this event running on the track! And it did. And in my opinion stole the show. Everyone I spoke to could not stop either looking at it or talking about it and when it appeared on the track taking photos of it. I know I did. Lew Arrington III was even on hand assisting Dave in photographing its official debut. All in all this was an amazing event and I’m glad that Denny invited me to cover it. I hope he asks me to do it next year as well. Did I mention that IT WAS HOT?